One could argue that there were two significant designers who ushered in the Modern. Working at the end of the nineteenth century, Christopher Dresser (1834–1904) took the ordinary object of everyday life, teapots, sugar bowls. creamers, toast racks and so on and radically updated them. Dresser used a limited vocabulary of forms: circles and squares, straight lines set in diagonals, a self imposed restraint that would characterize modern design. The other great pre-Modernist designer was Charles Rennie Mackintosh (1868-1928) who also limited himself to a small vocabulary of forms and shapes. Working within those possibilities, Mackintosh “reformed” the overstuffed Victorian furniture by stripping it of its cozy comforts and substituted form for decoration. With the Aesthetic Movement in England the idea of the “total work of art,” or the Gesamtkunstwerk, was expressed through the prime directive–to bring artistry to the domestic private interior, down to the smallest detail. The ideal of totality in art and design would be retained to this day. The credo for art and architecture for Mackintosh was “Art is the flower. Life is the Green Leaf. Let every artist strive to make his flower a beautiful living thing, something that will convince the world that there may be, there are, things more precious, more beautiful – more lasting than life itself.” The forms Mackintosh selected for his chairs were geometrically satisfying but ergonomically challenging. Of the two Dresser was perhaps the more successful if not necessarily the most impactful. Dresser was not an architect, he was an artist and industrial designer who worked for a manufacturer. In comparison, Mackintosh who was an architect, was more dependent upon clients and who may or may not have wanted the services of a modern designer. And another comparison needs to be made. As a designer, Dresser created singular objects, but as an architect, Mackintosh had to think of the total environment and created a Gesamtkunstwerk. To understand the Willow Tea Room in Glasgow, it to grasp the meaning of a total work of art as it played out in a public setting. The career of Mackintosh unfolded in a disadvantageous corner of time and place. The public that viewed the work of the architect was not in fashionable London, where design trends were constantly unfolding and where designers made their marks. Mackintosh was based in Scotland, and although he was know for a few very important buildings, his achievements were almost certainly less than they would have been had he been a post World War I artist. The works created by Mackintosh in Glasgow were not inspired so much by a machine-inspired style as by the prevailing desire to create an environment that was a coherent work of art. In contrast to Dresser, who was early to understand the possibilities of linking design to industry, Mackintosh was more interested in the evocation of beauty and in creating a beautiful environment. The career of Mackintosh was one of ups and downs, mostly downs, ending on a minor note. His was the problem of an independent architect with a unique design aesthetic, who, as part of an architectural firm, was forced to work for a variety of clients. Some of the clients were interested in having an architect designing a special building, others wanted something conventional and, on such occasions, his identifiable and famous style would be subsumed to the customer’s wishes. He never had the opportunities afforded to Le Corbusier–a post war world eager for modern design and willing to be open to new architects. One can find “Mackintosh” the designer and the “Mackintosh,” who is remembered today in the few projects he controlled, The Willow Tea Rooms. In Glasgow, having tea, taking tea, was not confined to the home but was also a public occasion. Jane Pettigrew and Bruce Richardson wrote in A Social History of Tea: “In 1903, The Builder’s Journal and Architecture Record reported: “Glasgow is a very Tokio for tea-rooms. Nowhere can one have so much for so little, and nowhere are such places more popular or frequented.” Out of this two century trade in tea in Glasgow came the commission that made Mackintosh famous in Scotland. The Willow Tea Rooms, a relatively early project, is one of the purest expressions of the Scottish architect’s rectilinear version of Art Nouveau. The Tea Rooms were conceived of as a total work, a complete environment, where one could enter and be enveloped in straight lines softened pastels. When Mackintosh was twenty eight he was self-consciously “artistic” and wore a large floppy bow tie in the current Aesthetic style of the 1880s. In Glasgow, the tradition of the tea room and the idea of going out to a restaurant that specialized in tea was started by a merchant of tea, Stuart Cranston. Cranston began by offering “tastings” and developed the idea of sampling a variety of teas, accompanied by sandwiches and cakes into a specialized tea room for his customers. Dinner at the end of the century was late in the evening and people got hungry, particularly men, who were Cranston’s primary customers. Tearooms offered a light meal of tea and sandwiches and were, during the growing temperance movement, a safe place for men to congregate and socialize socially. Cranston’s independent and entrepreneurial sister, Kate, began her own tearoom business, aimed at businessmen, an upper class clientele. There was, however, another group of customers, women, who, in the 1880s were enjoying increasing freedom to leave the home. 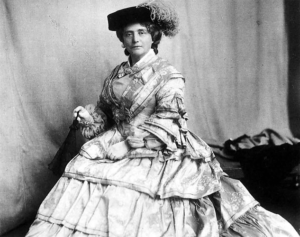 These women also wanted a place that belonged to them, a haven of feminine company without men, and Kate Cranston was happy to give these women a place to have afternoon tea. The question was how to furnish such a new sort of establishment? The tea rooms for men were rather informal and crowded, literally places where a man could eat hearty sandwiches and drink cups of tea while standing around in discussions with his friends. Women would want a room that would mirror the domestic experience of having tea at home in one’s parlor–delicate china and small fascinating sandwiches and pretty cakes. 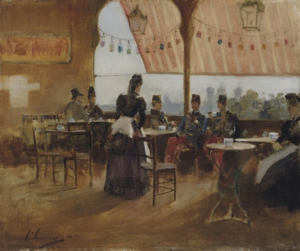 The idea of a “tea room” for women was very much at odds with the realities of the port city of Glasgow, a place of wealth and adventure and risk. What it had gained in business success had not been matched by cultural achievements.. In 1888, Glasgow hosted its first International Exhibition to not only advertise its commercial success but also to raise money for a museum and an art school, the Kelvingrove Art Gallery and Museum. Bringing high culture to Glasgow would give the city a veneer of respectability to paper over it current reputation for urban drunkenness and its dark history in the slave trade. Located in Kelvingrove Park, the main building of the Exhibition was a mash-up of the dome of St. Peter’s, the minarets of Hagia Sophia, and the towers of a Medieval castle. James Sellars combined unlikely architectural bedfellows in an eclectic manner typical of the cautious conservatism of the late nineteenth century, a time without an architectural style. The importance of the Exhibition was described in Volume 23 by The Studio in 1888: “Glasgow is often spoken of as a ‘dirty manufacturing town,’ with the implication that it possesses little architectural or artistic interest, and that its generally unattractive and prosaic appearance is not noticeably mitigated by the successful experiments of what is acknowledged to be an enlightened and progressive municipal government.” Although The Studio did not discuss the tea rooms, the first image in the discussion of the event was that of the entrance to Flint’s Tea Rooms, designed by “Dykes and Robertson, Architects.” The importance of the 1888 Exhibition for a young Mackintosh were the temporary tea rooms, set up for the crowds of visitors. These “themed” sites were less prestigious and therefore the designers had the license to explore more modern architectural styles that appealed to the broader public. A decade later, Glasgow continued to grown and needed more tea rooms for men and women. In fact, the Cranstons, crushed by the shift in taste from China to India tea, concentrated on the expansion of shops. Kate Cranston brought in a young and aspiring architect Charles Rennie Mackintosh in a limited role for her new tea room on Buchanan Street, asking him to paint murals on the walls in the new cutting edge style that would be called Art Nouveau. In 1898, he would be brought back to Argyle Street where he had total control over this new tea room. It was here that Mackintosh debuted his famous high-backed chair. In 1900, he designed the famous Ingram Street White Dining Room, followed by the last remaining and most famous tea room of them all, the Willow Tea Rooms on Sauchiehall Street. The Willow Tea Rooms is considered a historical treasure, and, like Mackintosh’s other tea rooms, representative of the “Glasgow Style,” an aesthetic identified with Mackintosh. This final effort of 1903 was the first time he had been given total control over an entire tea room. Working with is wife, graduate of the Glasgow School of Art, Mary MacDonald, Mackintosh created a Gesamtkunstwerk in the main dining area, the Room de Luxe. In the book, Taking Tea with Mackintosh: The Story of Miss Cranston’s Tea Room, Perilla Kinchin wrote that in 1897, Cranston’s newest and third tea room on Buchanan Street were opened to the public. It was their ‘new art’ interior decor that shot Miss Cranston’s rooms to notoriety–and among the interior’s most startlingly novel elements were some mural decorations by a 28 year old architect, Charles Rennie Mackintosh.Though Macintosh’s contribution was limited, he found in his eccentric middle-aged businesswoman his most important patron. The commission for Buchanan Street began a special relationship that was to span 20 odd years, from 1896 to 1917–the rest of Miss Cranston’s business life, and practically the whole of Mackintosh’s creative life as a designer. It was a connection that gave hime a thread of support through good times and bad, that produced from him a stream of creativity, that offered the ideal showcase for his exaggerated style of design.